When CNN recently released its list of the top islands for vacationers, the inclusion of Ko Tao, Thailand may have been a surprise to some. To the employees and customers of the Pullman Pattaya Hotel G, it was notice to the rest of the world that the waters of the Gulf of Thailand lap against the shores of some of the most beautiful and exotic locations you will find anywhere. While the Pullman Pattaya Hotel G isn’t located on Ko Tao, they share the same water and beaches that make this area of the world the latest hot spot for travelers looking to stay one step ahead of the hordes. While the beach bar exudes luxury at every corner, its location directly on the beach requires the shedding of unnecessarily fancy shoes to sift through the sand, while the soft seating invites both well heeled and high heeled clientele to keep those shoes off for a little longer and to let the beach bar accomplish what it was designed to do – make all the cares of the real world disappear and to enjoy the wonder of the moment. “Pullman Pattaya Hotel G, A beachside resort with upscale style, lots of good times and the total relaxation travelers crave. On its own private and tranquil beach, just a few minutes north of vibrant Pattaya City, Pullman Pattaya Hotel G provides the ideal getaway from city life with seaside activities, a serene spa and its own unique, very hip Beach Club. Always chic, the resort is dedicated to pleasure, with three swimming pools, a beach terrace and restaurants, all flowing together into Pattaya’s first and original Beach Club. It’s a place to chill out by the pool, dine well or where there’s always a party ready to start, whenever wanted. 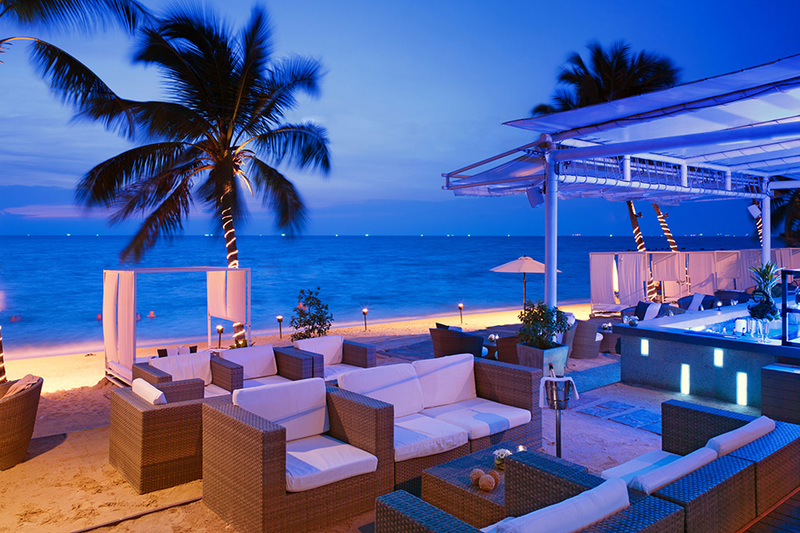 A fusion of indoor and outdoor dining, the Beach Club Restaurant offers sumptuous cuisine from Thai and international menus and an extensive wine list, and is complemented by the stylishly furnished poolside Pool Bar as well as an informal Beach Bar set right on the sand. The Beach Club also features the Sunset Lounge, an exclusive VIP area for Executive Club room and Suite guests. This cool and contemporary all-day dining outlet features an “open kitchen” offering both local and international cuisine. It’s all available. From cool mixology drinks, salads, sandwiches and ice cream to a fine dining grill, wine cellar “Chef’s Table” and sunset champagne cocktails with chill-out music. 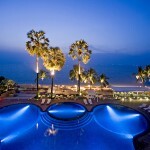 It’s also happens to be the place to catch the best sunset views in Pattaya. The resort comprises 353 rooms and suites, done elegantly in contemporary Thai style or classy white interiors with colorful Thai accents, state-of-the-art in-room technology, superb views and everything else that makes a relaxing stay unforgettable. For deeper relaxation and rejuvenation, the resort also houses Aisawan Spa, an inspiring complex of pavilions in the resort’s lush gardens, with beautiful sea views. The spa fulfills every relaxing dream of the mind and body … You can’t go home without it. Pullman Pattaya Hotel G also provides the recently renovated G Club fitness centre, featuring the fully equipped exercise and recreation technology. The G Club provides a step aerobics room, a games room, fitness ball, table football, table tennis, billiards/pool room and children’s activities such as computer games, rock climbing, and more. Located in North Pattaya at Wongamart Beach, Pullman Pattaya Hotel G is approximately 1.30 hours’ drive from Suvarnabhumi International Airport and only two hours from the Bangkok. All information regarding the hotel is available on www.pullmanpattayahotelG.com and for The Beach Club information and activities please follow our Facebook page on www.facebook.com/thebeachclubpattaya.G, or Instagram @beachclubrestaurant. 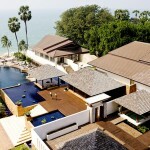 All images courtesy of the Pulluman Pattaya Hotel G.